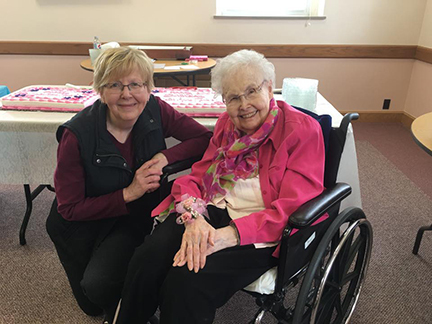 Pictured above: In celebration of her 100th birthday, Sister Anne Marie Kollasch’s family, friends and her Presentation community gather at Mount Loretto for a birthday celebration on Saturday, March 2. Pictured with Sister Anne Marie is her niece, Sister Maxine Kollasch, a member of the Sisters, Servants of the Immaculate Heart of Mary of Monroe, Michigan. Sister Anne Marie Kollasch has always loved history, and with her 100th birthday in March, she’s making some history of her own. She is the oldest member of the Dubuque Presentation community and is the longest-lived Kollasch on record. Sister Anne Marie currently resides at the Presentation Motherhouse (Mount Loretto) in Dubuque. She devotes her days to prayer and to listening to programs about history, politics and religion. She enjoys connecting with family and conversing with her Presentation Sisters and with staff who are part of the rich texture of her daily life. Sister Anne Marie notes that while the process of aging is challenging, it also gives her time to reflect on her experiences. She is grateful for a life that is not only long but also deeply meaningful. She writes in her autobiography, A Kollasch Collage, “I am ever aware of the ‘hundredfold’ that is mine as God’s beloved,” adding that she is thankful for the support of family, friends and religious community throughout her life. Her journey began in rural Iowa in 1919. She was born to Anna (Laubenthal) and Charles Kollasch on a farm near Whittemore, in the Diocese of Sioux City, established only 17 years earlier. Baptized as Margaret, she was joined in succeeding years by eight brothers and sisters. Faith, family and farming were central to Kollasch life and provided rich soil for young Margaret’s vocation. She attended grade school first at the country school and then at Presentation Academy in Whittemore, where she was taught by the Sisters of the Presentation. In her autobiography, she recounts that in third grade, while attending a mission talk at church, she set her heart on becoming a sister. Knowing it would be years before she could enter, she advised God, “Don’t let me forget.” God remembered. The desire for religious life stayed with Margaret throughout high school. She hoped to enter the Presentation community after graduation, but instead remained home to help the family during the challenges of the Great Depression. At that time, they had no electricity or running water, they raised their own food and money was scarce. They relied on God, one another and their neighbors, and found joy in the midst of hardship. In 1940, Margaret pursued her dream of religious life, and entered the Sisters of the Presentation in Dubuque, Iowa. After initial formation, she received the religious name of Anne Marie and professed final vows in 1946. Northwest Iowa continued to be fruitful spiritual territory. In the Presentation community alone, six of Sister Anne Marie’s relatives became sisters. Two siblings and a niece also joined religious communities. Many family members took active roles in their parishes as lectors, musicians and pastoral ministers, a tradition that continues today. In 1943, Sister Anne Marie began her ministry of teaching, which spanned 50 years. She taught at Catholic elementary schools in the Diocese of Sioux City and across Iowa: Mason City, Dubuque, Key West, Waukon, Charles City and Algona. Along the way, she earned a bachelor’s degree in history with a minor in English. After graduate work, she became a federally-certified remedial reading specialist. Sister Anne Marie retired in 1993 and returned to Mount Loretto where she takes great delight participating in liturgical celebrations and the beauty of her home. “As I continue my sojourn into the sunset of life, I am ever aware of the ‘hundredfold’ that is mine as God’s beloved. I find myself repeatedly telling God how grateful I am for His sustaining love at this time in my life. Unable to hurry as in the past, I’ve slowed down and now take time to ‘smell the roses,’ as they say,” smiles Sister Anne Marie.